The Eductor is the world’s largest medical software building upon the earlier versions of the EPFX (Electro Physiological Feedback Xrroid) and the QXCI/SCIO. Biofeedback is a method of educating your body to retrain itself. The Eductor makes it possible to query the body for its morst acute and chronic conditions and correct these stressors with focused energetic training. It does so because the body is electrical in nature, innately intelligent, and has the ability to heal itself if the right conditions or stimuli are provided. More importantly, the client becomes more aware of the unknown and can make changes to improve his or her own wellness. All objects resonate at a certain frequency that is why when a singer hits a specific musical note (frequency) the crystal glass shatters. Glass is brittle and the resonating causes it to shatter. However, cells when stimulated at the correct frequency resonate. In fact, increased cellular activity increases the energy produced by the cells. This production of ATP (the energy molecule) has been studied and found to increase by 500%. The history of Biofeedback in relation to cell frequencies gained widespread attention in the late 1960′s and early 1970′s when the brain waves of yogis in India were studeied by Dr. Elmer Green and found to be on a different level such that they could slow their heart rates down to the point that they could even stop the heart from beating and not die. The medical profession created computer devices to monitor heart rates, circulation of blood, skin temperature and tightness in the muscles as effected by mental thoughts and feelings. Training one to relax certain muscles, think different thoughts and interact with the computer program meant relief of pain–in the back, the head, migrains, etc. Other frequency measuring machines were developed even earlier with pioneers like Royal Rife who had great success using frequency machines to treat all kinds of illnesses, by and small. For example, Rife discovered by zapping a cancer cell’s membrane with the frequency of the cell’s membrane, he could shatter the membrane and the client could drink water and wash away the toxins. By the 1920’s, many medical doctors used frequency machines and got desired results for their patients. In 1934, the president of the American Medical Association, Morris Fishbein, was denied his offer to buy the exclusive rights technology from Royal Rife. Because the AMA had complete power to revoke medical licenses, Fishbein drove him and many other medical doctors out of business. Rife was put in jail and his equipment smashed. Even today, in some states, if one talks about Rife or advertises his technology, that person can be penalized. Then in the 1950s, a doctor in Vancouver, British Columbia bought a medical practice and found an old-time frequency machine from the 1920’s complete with notebook that listed the frequencies used to treat various conditions. The underground doctors were born. They experimented with frequencies and made adjustments until 1987 when a chiropractor named Carolyn McMakin went to build her own machine. Using it on herself and volunteers, she found the machine did no harm and started sharing the technique with other doctors. The past twenty years have seen the development of computerized devices that measure the cells frequencies in order to establish the status of a healthy body. These machines offers state of the art biofeedback that have never been available before. Unlike the old style point probe devices that take in one electrical measure every second at best, the EPFX is taking in 110 electrical measures every 2000ths of a second. Hence, the word Xrroid means rapid response. Professor Desire Dubounet the world’s most famous Naturopath and her friends have spent over 35 million dollars to bring the world a professional and thorough course on Wellness, Naturopathy and Neuro-Electro-Physiology of Briofeedback as Bioresonance. Go to www.imune.name for more information. In a recent interview, she described the unique process by saying: “what we are doing is measuring electromagnetic three-dimensional shapes in the patient, in the homeopathic and then seeing how they are compatible… We analyze every hormone, every chemical, every mineral, everything we analyze; we’re going to find out that there is a Trivector Field, an electromagnetic and an electrostatic field around it that is a signature field. This field cannot be reduced to a single frequency. It could only be understood in a multitude of frequencies, which we call a frequency band or frequency picture, or a frequency signature that allows our shape receptors to get this”. Biofeedback has been scientifically proven to reeducate and train the body to alter your blood pressure, heart rate, brain activity and other critical functions. Biofeedback has a scientifically proven track record of having positive effects on your emotional and physical well being. In addition to biofeedback, the Eductor is the world’s largest software package that houses many programs and assessment tools. 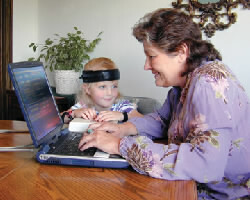 Like Biofeedback equipment, it uses an attached small box (upgraded models use the SCIO) and wrist, ankle wraps and head band as a harness with a computer to scan and assess abnormal energy. DOES NOT DIAGNOSE A SPECIFIC DISEASE! Detects the abnormality of frequencies associated with a particular diseased organ or disease state. Trained staff evaluates the readings. No claims are made of the system, its results and nothing that the Eductor or Mary Jeanette Clement does. She does not diagnose or treat illness or disease nor replaces any other treatment by medical doctors. The Eductor64 does not replace the care of your doctor or licensed healthcare providers. However, by reducing the stress in your body which often causes or contributes to illness, stress reduction may help the body begin healing itself, which is its nature. CALL 615-206-1553 or 615-559-5272 FOR AN APPOINTMENT TODAY!! Disclaimer: No claims are made of this system or its results and nothing that the Mary Jeanette Clement does. She does not diagnosis or treat any illness or disease. Please consult your family medical doctor for the diagnois or treatment of disease and before undertaking any health program. Enjoy the benefits of Eductor64 with Expert Coaching Today!